Revolutionizing the ad buying process by making it more cost effective! 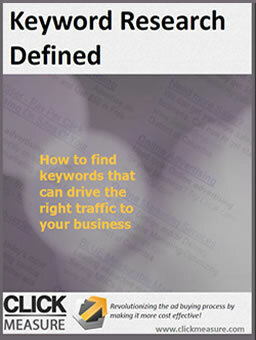 How to find keywords that can drive the right traffic to your business. If you don’t have a defined strategy for finding the right keywords you may be wasting valuable time. Researching Keywords can tricky. Get the latest tips designed to help navigate the complicated task of selecting the right keywords. In Click Measure Media's new ebook you will find detailed instructions on how to organize your keyword list for the maximum return on your advertising budget. Join us on Facebook! Join us on Twitter! Join us on LinkedIn!